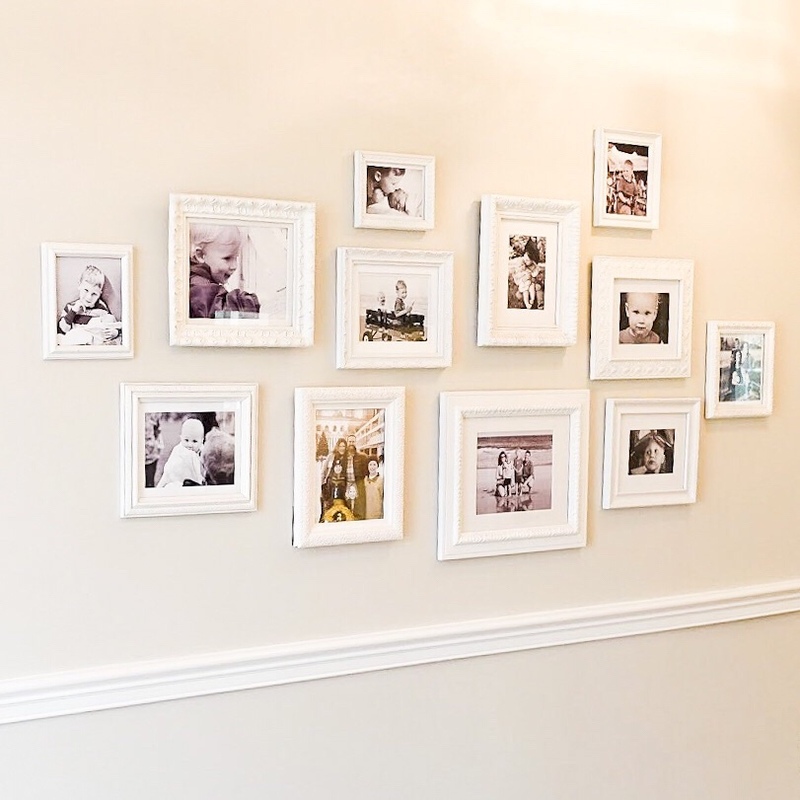 When I was pregnant with my third kiddo and in full nesting mode I wanted to create a gallery wall in our front hallway. My plan was to finish the project before baby came, but she had other plans. I remember dashing to the thrift store during preschool and carrying a stack of frames out thinking huh that kinda feels like a contraction. The next morning, three weeks before her due date, little miss was born. 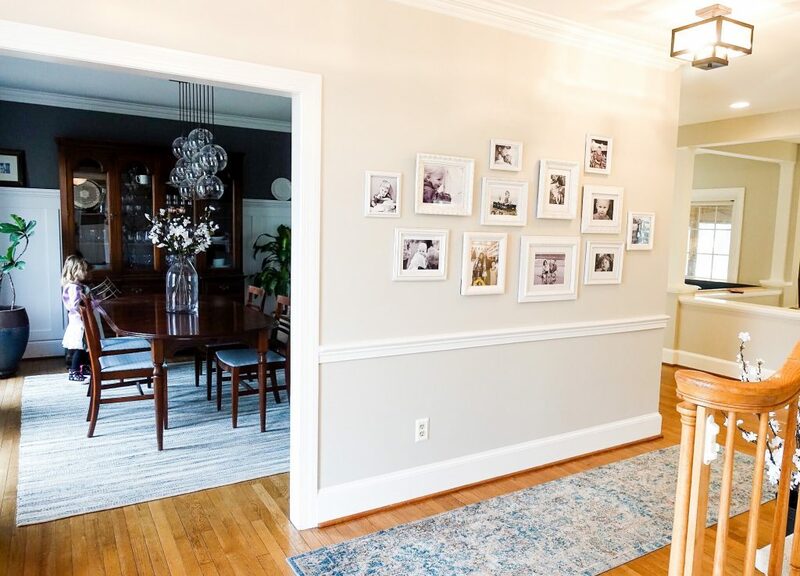 I’m thinking she wanted to make sure her picture made it up on that gallery wall 😉 We will show you how to create an affordable farmhouse style photo gallery wall in your front hallway or any room in your house. To create the farmhouse gallery wall I collected different frames from Goodwill, thrift stores and clearance racks. Make sure to keep a look out for ones with a chunky detailed frame in varying sizes and shapes. Don’t pay attention to the color since that is easily changed with a few coats of spray paint. We also chose to add photo mats to most of the frames too. These can be found at your local craft store. We decided to coat all of the frames with a single color of spray paint. Since the frames were all a little different, painting them the same color tied them all together. We chose one with a matte finish and primer built in. Layout all of the frames on cardboard, newspaper or an old tarp in a well ventilated area. Check the spray paint directions for instructions on optimal weather conditions. We have tried to use spray paint when it’s too cold or too humid and have run into some problems. So double check on that before you start. Spray the frames with a thin coat of spray paint and let it dry according to the paint directions. Continue to spray the frames with thin coats, letting it dry in between, until they are sufficiently covered. Once we had a variety of frames we taped together pieces of paper and cut them out in the same size as the different frames. Put a little piece of painters tape on the frame and mark it with a number. Number the paper with the same number as the matching frame. Play with the look, by moving the paper around at varying heights and locations. Once you have an arrangement that you’re happy with start switching out the paper for the matching frames. 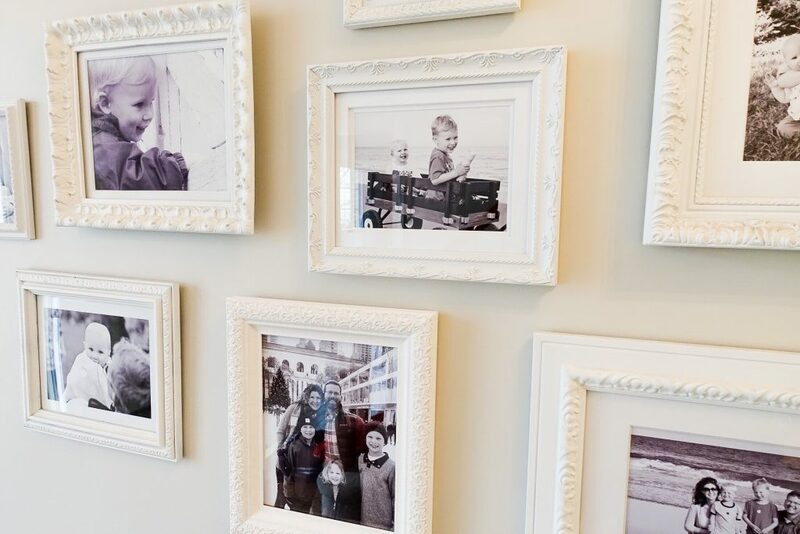 Pop in your photos and hang up your frames.